A newly published study reviewed 61 studies that looked at daily tree nut consumption on cardiovascular risk factors and found many health benefits. Tree nut (walnuts, almonds, pistachios, macadamia nuts, pecans, cashews, hazelnuts, and Brazil nuts) consumption lowers total cholesterol, LDL cholesterol, triglycerides, and ApoB, the primary protein in LDL cholesterol. It appeared that nut dose is more important than nut type in lowering cholesterol. The beneficial health effects are greater at about 60 grams (about 2 oz or 2 servings) or more nuts consumed per day, but positive health effects are also found at one serving per day. Five studies found that 100 g nuts per day lowered concentrations of LDL cholesterol by up to 35 mg/dL - an effect size comparable to some statin regimens. A new study published in the American Journal of Clinical Nutrition found that consuming tree nuts, such as walnuts, may lower the risk of cardiovascular disease. After conducting a systematic review and meta-analysis of 61 controlled trials, one of the authors, Michael Falk, PhD, Life Sciences Research Organization, found that consuming tree nuts lowers total cholesterol, triglycerides, LDL cholesterol, and ApoB, the primary protein found in LDL cholesterol. These are key factors that are used to evaluate a person's risk of cardiovascular disease. Walnuts were investigated in 21 of the 61 trials, more than any other nut reviewed in this study. "Our study results further support the growing body of research that tree nuts, such as walnuts, can reduce the risk of cardiovascular diseases," said Dr. Falk. "Tree nuts contain important nutrients such as unsaturated fats, protein, vitamins and minerals. 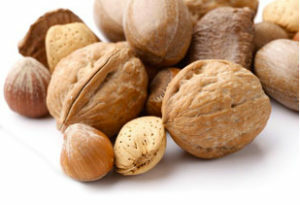 Walnuts are the only nut that provide a significant amount (2.5 grams per one ounce serving) of alpha-linolenic acid (ALA), the plant-based form of omega-3s." Beyond finding that tree nuts lower total cholesterol, triglycerides, LDL cholesterol and ApoB, researchers also found that consuming at least two servings (two ounces) per day of tree nuts, such as walnuts, has stronger effects on total cholesterol and LDL. Additionally, results showed that tree nut consumption may be particularly important for lowering the risk of heart disease in individuals with type 2 diabetes. Of 1,301 articles surveyed, 61 trials met eligibility criteria for this systematic review and meta-analysis, totaling 2,582 unique participants. Trials directly provided nuts to the intervention group rather than relying solely on dietary advice to consume nuts. The dose of nuts varied from 5 to 100 g/day and most participants followed their typical diet.